First of all, I want to apology for abandoning the blog for long time. Recently, my activity have been centered in other things, specialy the festival I organise ([C]Screen) and I don’t have a lot of time. So I couldn’t post. Shortly, I will be publishing online all the screendances I have made with Marta Kosieradzka, so you can enjoy them openly. I am tired of Vimeo private (laughs!). The videos will be published every Wednesday at 18:30h (UTC+1). 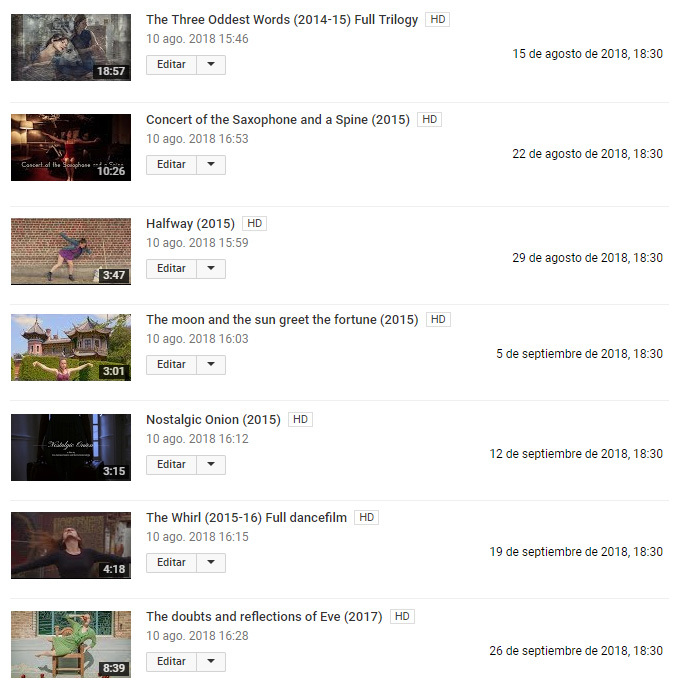 You will be able to find them at my own YouTube Channel, in concret in a list I have created for that. You are very welcome to watch them and leave comments! Writing this blogs takes me a lot of time and effort... even if it's just a cent. Escribir este blog me lleva mucho tiempo y esfuerzo... incluso si es sólo un céntimo.